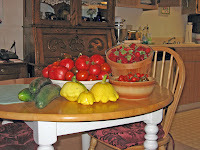 A trip to the garden today left us with a bounty of vegetables. 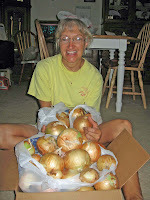 Michael planted one bunch of Texas Super Sweet Onions and it yielded 33 pounds of onions. He also had several tomatoes, squash and cucumbers. I had lots of tomatoes and a few squash from my plot. So what to do when life gives you potatoes and onions...make potato salad. Now what do we do with the rest? You can only eat so much potato salad. You can bet we will be searching for lots of recipes. We are already getting creative with thoughts of stuffing tomatoes with potato salad and cucumber salad...making tomato sauce...and on and on. We also have a lot of basil of several varieties. I usu ally dry some and make a pesto that I freeze. I love Cinnamon Basil, Genovese and Opal and sometimes I mix them and sometimes I make each one separate. 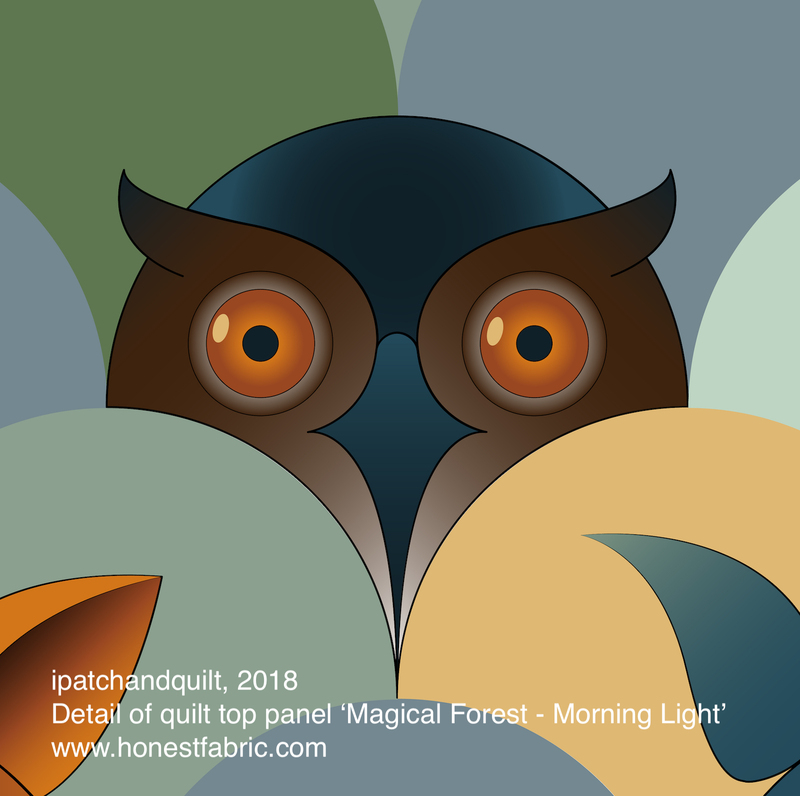 Oh, how I love this time of year! I even bought some fresh peaches the other day and made a peach pie that was very delicious and just what I had been craving. 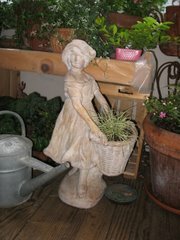 I am sure I will be dreaming of things to do with all the organically grown veggies that we are starting to harvest. 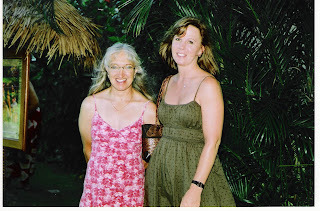 Last week I was in Hawaii with my sister. We had a great time and saw many things. We drove a lot, soaked up some sun and some waves, ate great food and had a chance to just girl talk. We even made wishes on a very bright star that I'm still not sure was a star, but I hope that it was because my little sister deserves to have her wishes come true. I know that she would never ask for much, all the more reason for at least one wish to come true for her. I can't stop thanking her for taking me on this trip, it will be very special to me for the rest of my life. Thanks again Philina!